My husband and I LOVE fried rice from our local chinese restaurant. There is something so comfortable and flavorful about fried rice and its so sad that takeout restaurants make it so bad for you. I have taken this comfortable treat and lightened it up and added oh so much flavor! The dish starts with this oh-so-easy Teriyaki sauce, which packs so much punch with so little sauce. 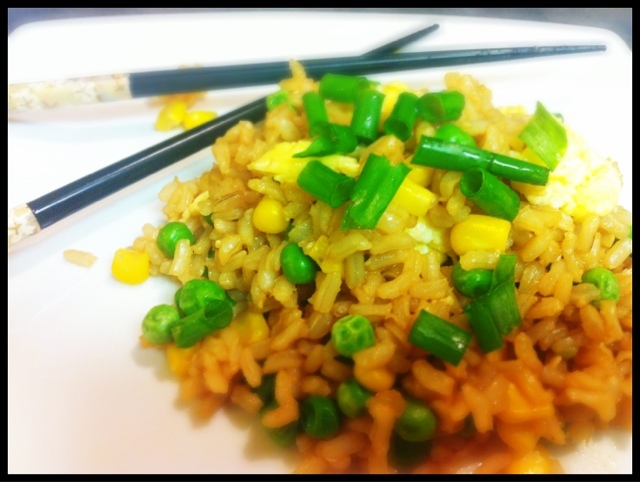 It easily coats the rice and complements the vegetables so very well. If you want to add even more diminution you can add protein, feel free to mix in some teriyaki chicken or spicy shrimp. In the same pan add vegetables and cook intil firm but hot. Add the rice and sauce and cook for 3 to 5 minutes stirring constantly to make sure everything is mixed well and coated with sauce.